Hey all of you travelers out there! This is my all time favorite site. Of course, I'm saying that because I (Edward) built it! However, if you are friends of Marian and Edward, or if you just like good goofy adventure then I think you will enjoy this site. We love to travel around, and I have put up picks and links to places we have explored. I will also try to share some of our experiences and give some critiques. Perhaps, these are some places that you would like to visit too. I have also put up some links to some of our more personal sites that discuss our feelings and beliefs. Feel free to explore! We are not professionals, by any means. All of our photos where taken by an HP 5.2 Megapixel Camera. We have thought about getting an SLR but money is tight. Still, I think for the camera we use they are some pretty good shots. Marian and I met in Houston while attending the same church together. I would like to say that it was love at first sight but it wasn't. We did like each other right away, but it was two years of casual friendship before I even made a move. When I did make a move she was headed for Provo, Utah to continue her music studies in Kodaly. Though it was only for a few months it did not seem the ideal way to start a relationship. In order to find a way for us to spend time together, Marian invited me to travel with her family up to Oregon where they where having a family reunion. I had never been to Oregon and I had family in Idaho that I was anxious to see, so I agreed to go. It was great. Stuck in the car for long periods of time, we really got to know one another, and each became familiar with the other's family. This was real important to me. I loved her family and she loved mine. By the end of the trip we agreed that marriage was the correct course. After I returned home I began shopping for a ring. About a week or two after she returned home I came over to her house intending to propose. She had left some laundry at my house because she didn't have a dryer. I brought the clothes back and stuck the ring down in the laundry. She had been expecting a ring, but I gave her the impression that I had not been able to look for one. I gave her the laundry and encouraged her to put it away. Of course she didn't want to. So I told her that if she did I would go and get her a ring. It was a great suprise when she got half way through the basket and found the little black box. I took it from her, got down on one knee, and proposed. The engagement was a lengthy one. I went off to boot camp and tech school for the Air Force Reserves, while she was left to prepare the wedding. The whole time in training I was sweating. I could not afford any delays in my schedule. The arrangements had all been made and the reservations set. By the grace of God I made it out on time to be married in American Fork, Utah Dec. 27th 2006. It has been wonderful, and we have never looked back. I'm such a nerd! For some reason she loves me! 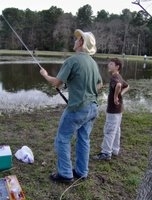 This is me working... or umm me fishing with my nephew. I am a Texan Boy, born and raised. Born in Houston, I was raised near the Sam Houston National Forest in Montgomery Texas. Marian is a Texas Transplant. She came to Texas to student teach and fell in love with the state. She was born in Oregon, and has lived in Washington, Colorado, Califonia, and Utah. We share a rich life together, full of love. See you on the beaches of the world!